Unfortunately for us impatient growers, harvesting at the right time is just as important as how you grow the plant. Harvest too soon and you lose potency and cannabis yields; too late and you can end up making a batch of sleep medicine. The knowledge of when to harvest – You get that today! Eyes for visual inspection – You’ve probably had these for a while! 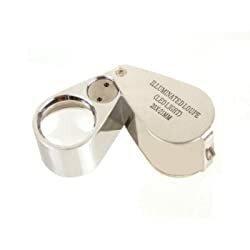 Jewelers Loupe – This is the cheapest and most low tech way to get the job done. Unfortunately, it will also give you the least insight into how your buds are doing. 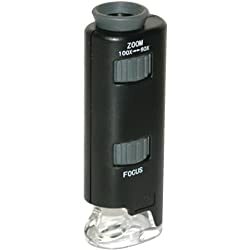 Handheld Magnifier – These can create a much larger picture because they can magnify more than a jewelers loupe. However, this power makes them a bit harder to focus. Digital Microscope – A digital microscope is the final word in determining harvest time. It costs a bit more and needs a connecting laptop, but it’ll get you face-to-face with your trichomes. You’ll be almost uncomfortably close to your trichomes! Check out the videosin the article for a demonstration! There are two ways you can identify the right time to harvest your plants. 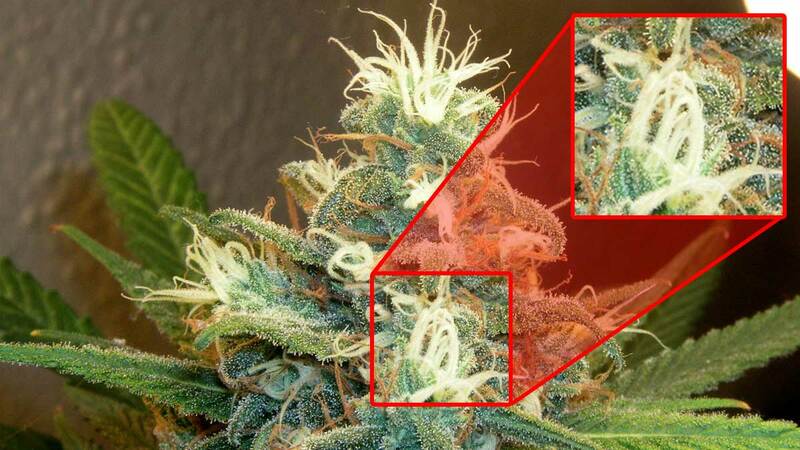 First, we’ll show you how to identify harvest time by checking the pistils (the ‘hairs’ on your buds). The pistil method isn’t nearly as accurate as checking the trichomes (the ‘glitter’ on your buds), but it’s definitely a good place to start since you can just look at the buds and get a general idea. 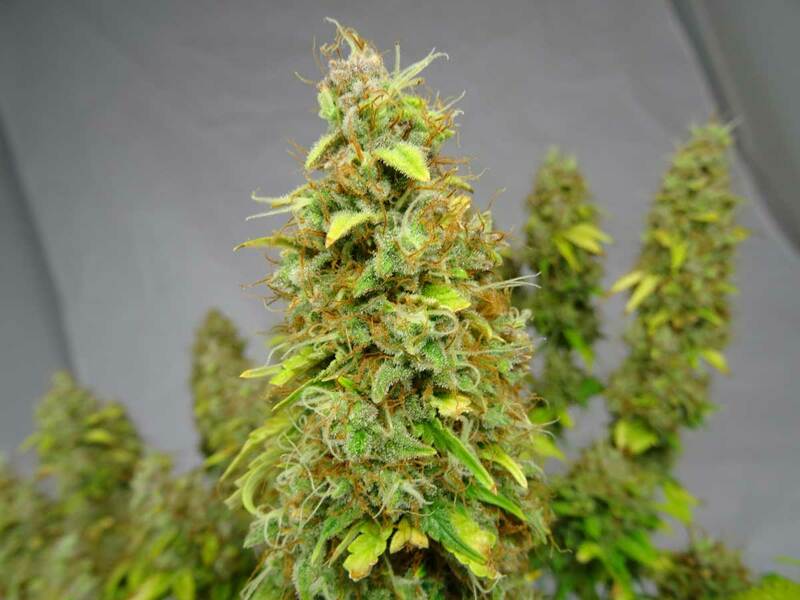 The following marijuana harvest pictures will guide you, so you know when to harvest your marijuana buds using ‘The Pistil Method’. 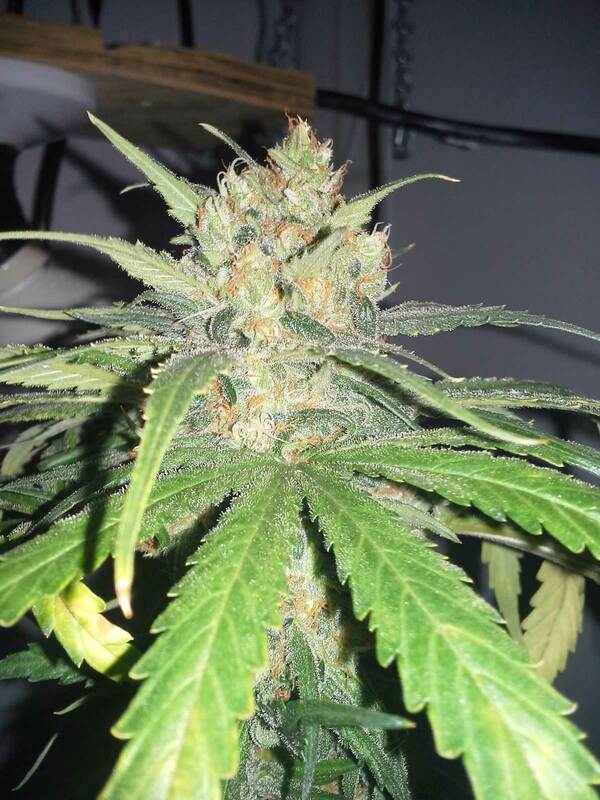 See More Pictures of Buds That Are Ready to Harvest! The vast majority of pistils (hairs) are still white and sticking out straight. This is definitely too early to harvest, and these plants have many weeks to go! We’re waiting for at least half of the white hairs to darken and curl in. 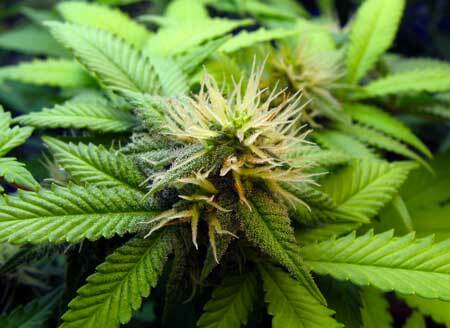 Some of the pistils are starting to turn color, but there are far less than 50% curled/darkened pistils. 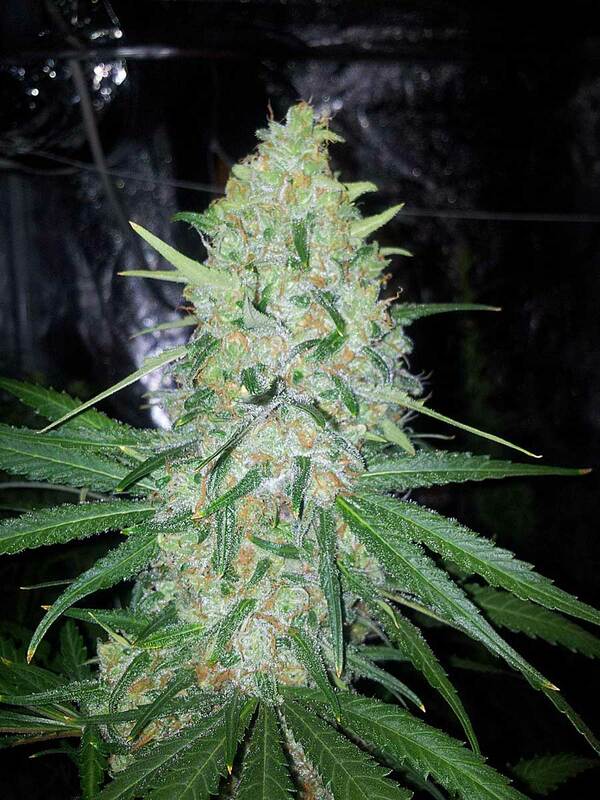 These buds still have several weeks to go before they’ll reach their highest levels of THC. The good news is your buds will get bigger and more dense in that time! 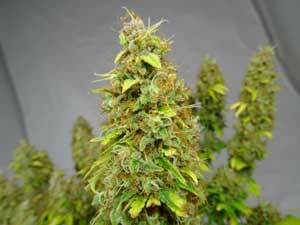 Harvest when 60-70% of hairs have darkened for highest levels of THC. anti-anxiety effect as some THC turns to the more relaxing CBN. 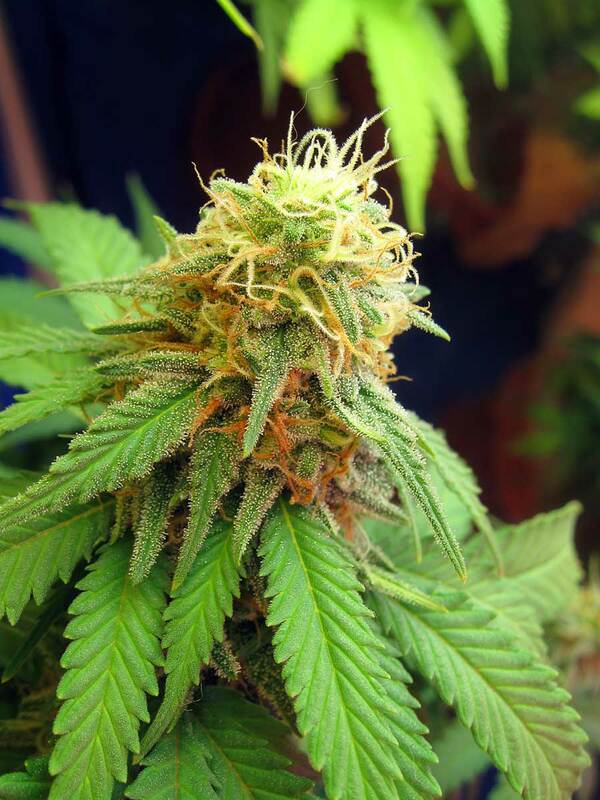 With some strains, you may see a bunch of new pistils appear right when you think you’re getting close. This is normal, but it happens more than 3 times you’ve eventually got to just make the decision and chop. Learn how to speed up the time to harvest. 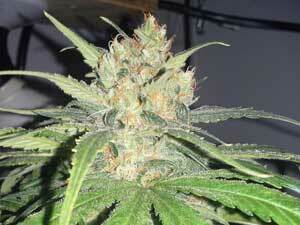 See More Pictures of Ready-to-Harvest Buds! With some strains, it is much harder to tell when the time is right. 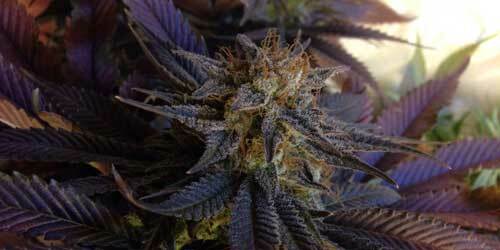 Different strains can look different ways at harvest. 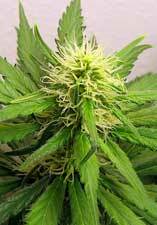 For example, some strains can keep most of their pistils white even when they’re ready to be harvested. You can get some good information by talking to someone who has grown your strain before, such as the breeder. The breeder or growers who’ve grown your strain before can often provide extra insight into what to look for at harvest. 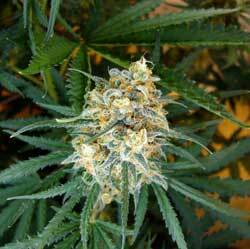 You can also search online for pictures of what your strain should look like when it’s fully ripened. This harvest method tends to be more precise than looking at the pistils of your cannabis plant. With this method, you look at the glandular stalked trichomes on the buds under a magnifying glass. Trichomes are the the mushroom-looking growths on cannabis that are responsible for it being so popular! 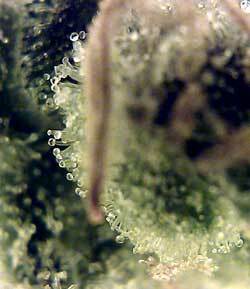 In some places these trichomes are called resin glands. 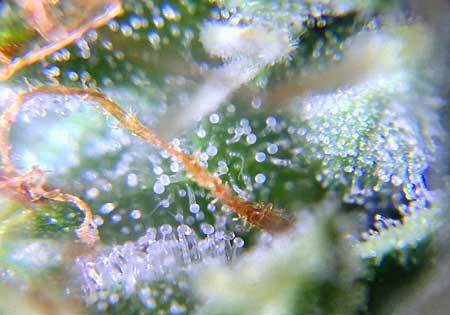 These trichromes are the ‘crystals’, or ‘frosty stuff’ you see accumulating on your bud/leaves. They’re also what makes weed so sticky. The trichomes you’re trying to see look like little mushrooms. You may also see tiny, clear hair-like trichomes without the mushroom head but these don’t affect potency so you can ignore them. You are interested in the trichomes that have a little ball on top. This is where a lot of the THC and other good stuff in cannabis is located. Since these trichomes are what contribute the most to bud potency, being able to tell when they’ve reached their highest levels of THC will help you be able to choose the exact right time to harvest your marijuana. Jeweler’s loupes are relatively cheap to buy online, or at a hardware or jewelry store. If you put the loupe right up to your buds, you’ll get a better view of the trichomes, letting you better determine their color and shape. Click the picture to the left for a close-up to see what that looks like. Although a jeweler’s loupe can make trichomes appear bigger, sometimes it’s not big enough. I know I end up squinting a lot when I’m trying to use one, but they are a heck of a lot better than nothing! 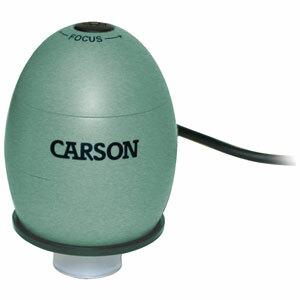 Another option is to use a 30x-60x power illuminated microscope. These magnify the trichomes a little more than a jeweler’s loupe, but they can be hard to see through since you’re basically looking through a narrow tube. You have a more limited range of view so it can be harder to focus in on what you’re looking at. 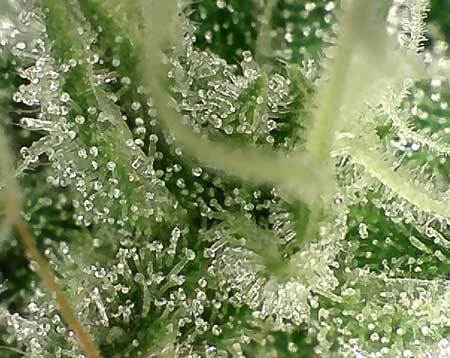 A digital microscope that takes video works even better than a jeweler’s loupe or other magnifers since you get a much clearer pic of the trichomes. Not only can you see the trichomes better, but you can record video of them to look over after the fact. These are still pretty cheap, costing about $40, and they will give you better results than any other method for determining harvest. 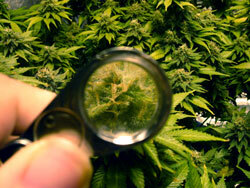 Here’s an example of a digital microscope in action – these buds are ready to harvest. when to harvest marijuana buds based on color of trichomes. I still can’t tell the difference between clear and cloudy trichomes!!! It can be hard to tell the difference between clear and cloudy trichomes, especially if you don’t see both types of trichomes at the same time! This is completely normal, and it takes a little experience before this part becomes totally easy. However, when in doubt, consult with the pictures of buds above. If you combine both methods you’ll get the best results! 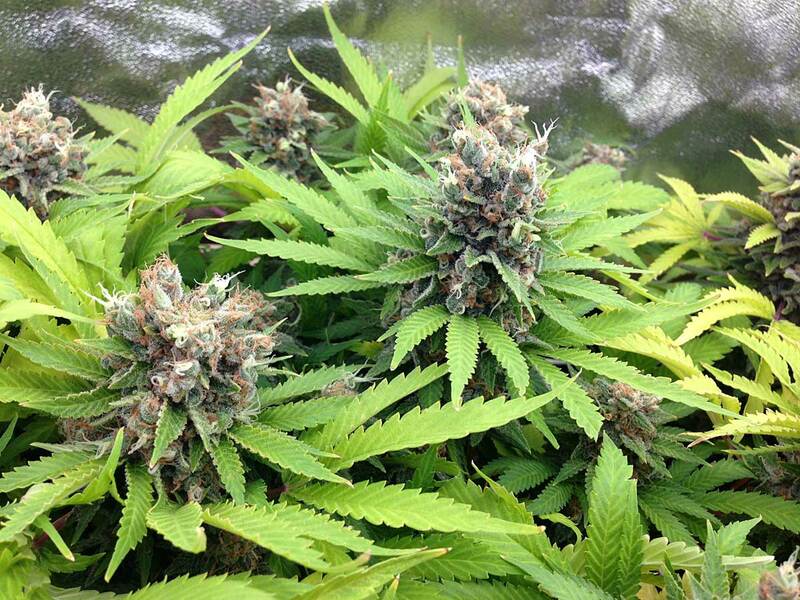 Although looking at your buds isn’t the most precise way to know when to harvest, it does give you a really good idea. Try to take everything together. If your buds just have white pistils sticking out, you know for sure that it’s no where close to ready, so you also know that the trichomes on the buds aren’t all cloudy yet. It’s only when your buds are getting close to looking harvest-ready that trichomes are going to have something to tell you! The trichomes in this picture are still mostly clear, but that may be difficult to know immediately if you haven’t really looked at trichomes before! However, I don’t even really need to look at the trichomes in this picture to know these buds aren’t ready yet. There are other signs it’s not ready. I can clearly see several white pistils sticking straight out in the photo. The only two pistils that have darkened haven’t even curled in yet. But even without looking the trichomes, the the fact that all the pistils are sticking straight out has already shown that this bud isn’t ready. If there aren’t any pistils curling in, it means you still have several weeks to go! When you’re not sure, try to use a combination of looking at the buds and looking at the trichomes! Many of the cannabinoids we enjoy most are produced within these glandular stalked trichomes. This includes THC, CBD, and CBN amongst others. Learn everything you could possibly want to know about cannabinoid levels in your marijuana, and what you need to do as a grower to control the potency of the buds you grow. 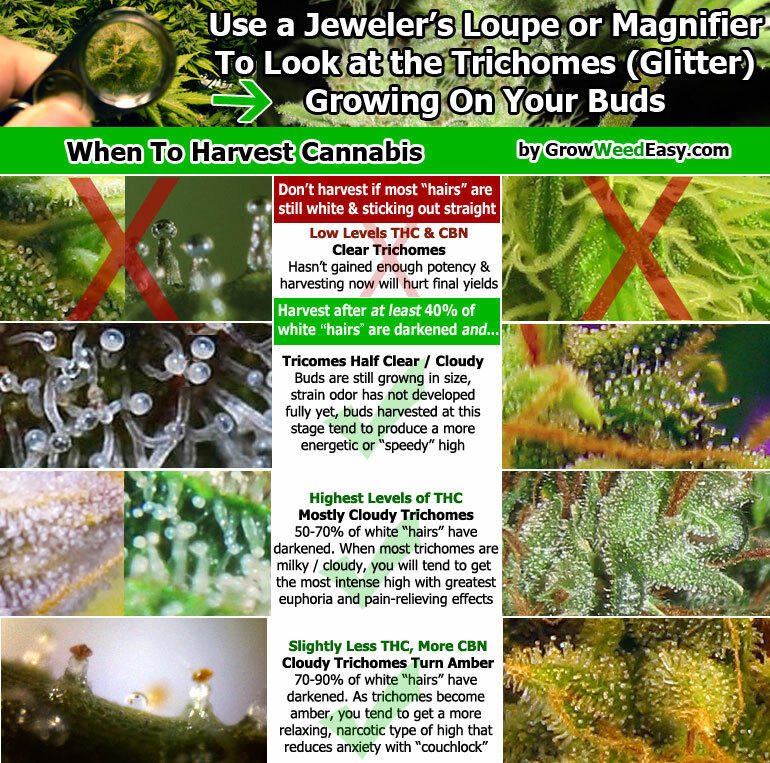 Here are some general rules about harvesting marijuana based on trichomes and the color of the hairs / pistils. If you follow these rules, you’ll know how to harvest weed perfectly every time! 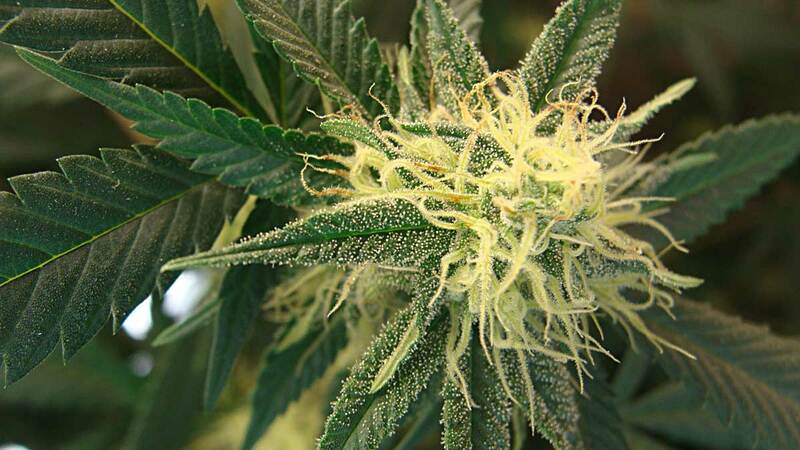 The beginning of the harvest window opens when your plant has mostly stopped growing new white “hairs” or pistils and at least 40% of the white hairs have darkened and curled in. 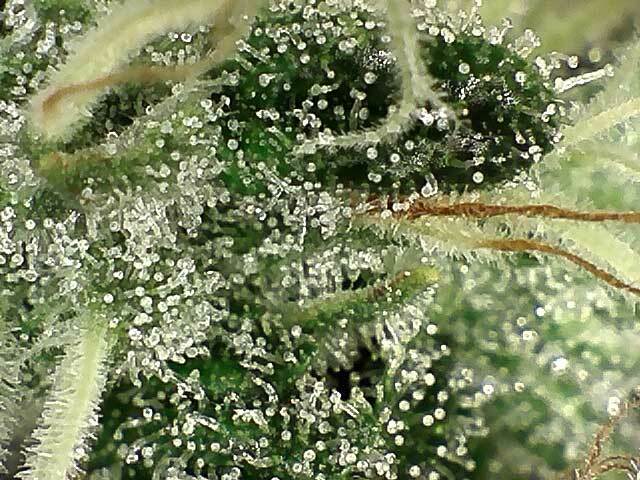 Highest level of THC is when many/most of the trichomes have turned milky white / cloudy (when viewed under a magnifier). Trichomes that are milky have the highest levels of THC are “ready to harvest” and contribute to more euphoric and psychoactive effects. At this point 50-70% of the pistils have darkened. Some Sativa & Haze strains have trichomes that never really turn amber. If they’ve turned mostly white and don’t seem to be progressing further, it may be time to harvest! The most “couchlock” or sedating effect happens towards the end of the pot harvest window, when the trichomes have become a darker color (usually amber/gold). The best results from amber trichomes come from indica strains. 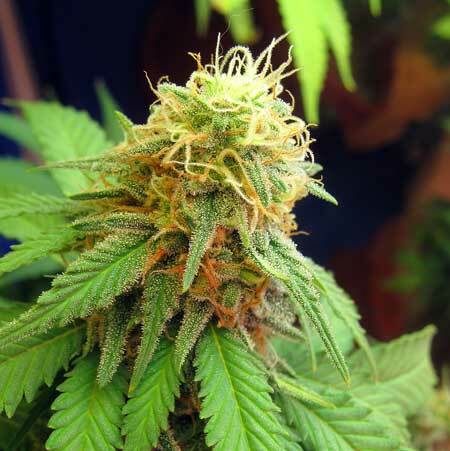 The amber/yellow trichomes contribute to a ‘body high’. Some of the THC has converted into less psychoactive CBN, which has calming and anti-anxiety effects. 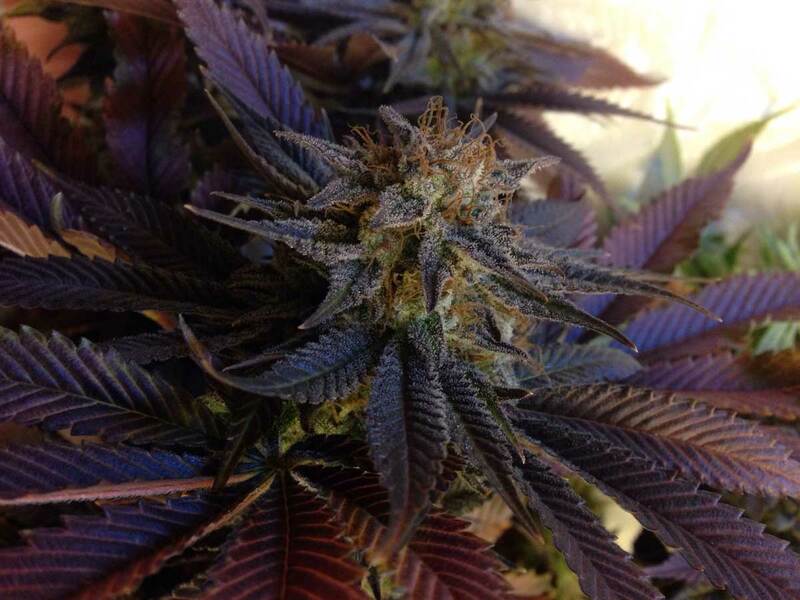 With some strains, the trichomes will even turn red or purple! I like to harvest around when 20% have turned amber. At this point 70-90% of the pistils have darkened. Harvesting later will increase the sedating effects, but may also start reducing the psychoactive effects. When trichomes start looking grey or withered, the harvest window has passed, and buds will make you sleepy without many psychoactive effects. Usually it takes several weeks (4 or more) from the beginning of the harvest window for this to happen. It’s much easier to harvest too early than too late! Want more of an ‘in-your-head’ effect? Harvest your buds earlier, when only 40% of hairs have darkened and curled in and more than half of the trichomes are part clear/ part milky or mostly cloudy/milky. 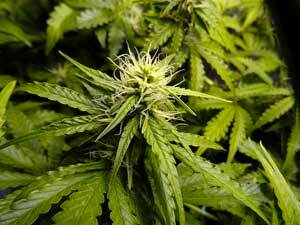 For the “strongest” marijuana buds with the most psychoactive effects, and the highest levels of THC, harvest when almost all trichomes are cloudy/milky. 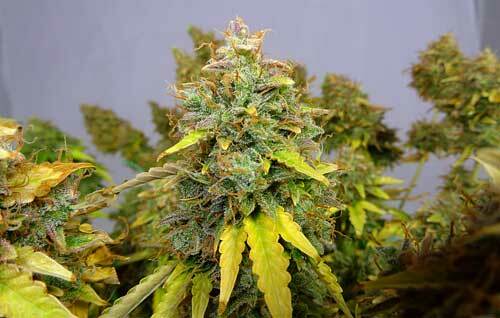 For more relaxing, anti-anxiety buds, wait until at least some of the milky / cloudy trichomes have darkened to amber. More amber = more relaxing, though the effects may be somewhat less psychoactive. Remember, curing your buds properly for at least 2 weeks to a month will also give them more of an anti-anxiety effect. 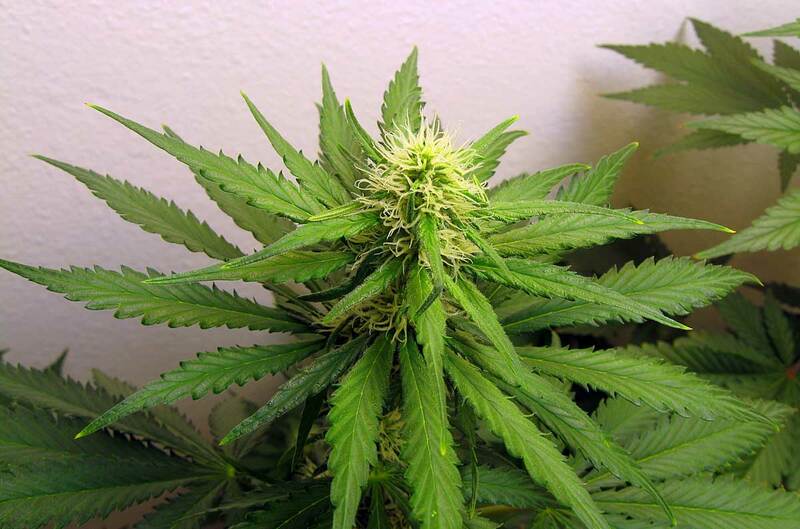 When growing your own marijuana plants, you can certainly sample buds off your plant at different stages to get an idea for what your preferences are. It’s okay to cut off pieces at a time! The hardest part of growing cannabis for many new growers is waiting for the right time to harvest. There is a strong tendency for new growers to harvest the plant early due to excitement. Unfortunately, this often results in low yields and lower-potency buds. If you are feeling excited about harvesting your marijuana plant, pull buds off the plant that look the most done and dry them and check the potency for yourself. When in doubt, listen to your gut. Using both methods together will help you pick the best time to harvest, but only YOU know how you want your buds to turn out. This means that even the best methods are just general guidelines. But hopefully, you’re now closer to getting your bud the way you want it.